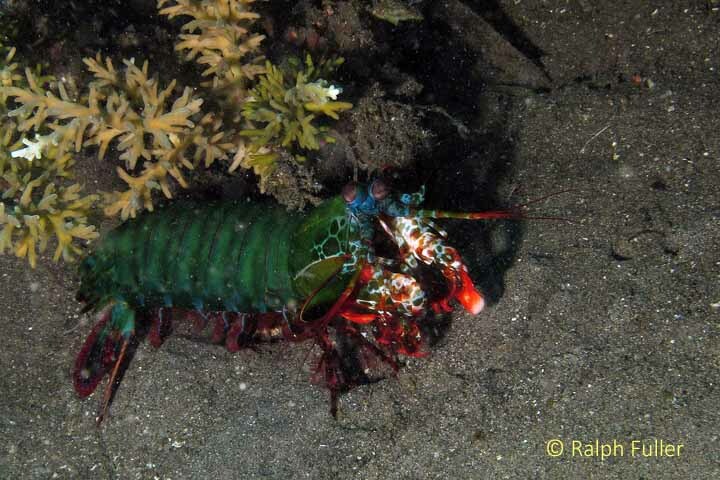 Mantis Shrimps – Tough, Strong and Hot! A smasher in both looks and behavior, the peacock mantis (Odontodactylus scyllarus) is an Indo-Pacific species. MANTIS SHRIMPS ARE HOT. Not as hot as sharks and manta rays always are, but in recent years they’ve been experiencing a flurry of attention, from a NatGeo special – “KILLER SHRIMP” (naturally) – to a spate of research looking at their speed of attack, strength and visual acuity. 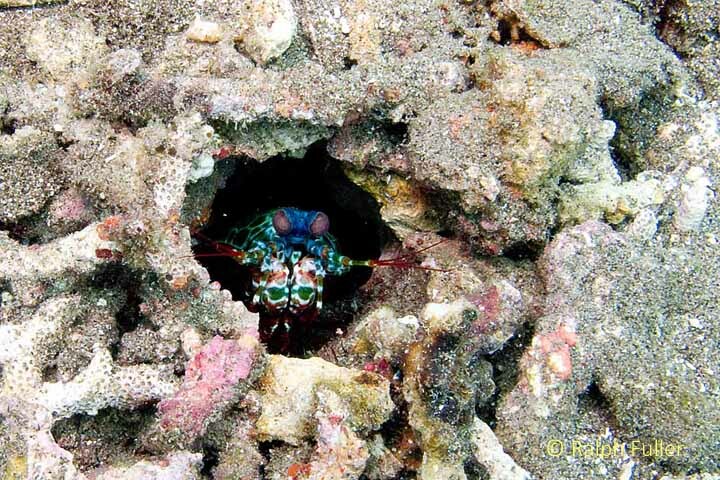 Despite their common nomenclature, mantis shrimps are neither shrimps nor assassins of divers or other human beings. They are highly efficient predators of other marine animals, they’re strong, tough and fast. And, among fishermen they’re referred to as “thumb splitters” because of their propensity for inflicting serious wounds with their spearing limbs when inadvertently brought up in nets. Unless they’re the smashing kind, who break fingers. The research interest reflects the fact that mantises’ vision capabilities appear to be extraordinary, their speed of attack among the fastest in the world and the strength of their knock-out punches among the strongest. Scientists want to understand how they do all that so they can replicate their characteristics to build stronger body armor, motor vehicle bodies and crash helmets, for example. Mantises are members of the order Stomatopoda, a group of crustaceans that split off from other crustaceans some 200 million years ago. Thus, they’re distantly related to shrimps, crabs and lobsters, but different. If they were shrimps, they’d personify the oxymoron “jumbo shrimps.” Depending on their species, they can range from one to 15 inches in length. The ones you’re most likely to see, or notice, are about seven inches in length. Mantises get their name because they come equipped with a pair of enlarged “raptorial appendages,” or “dactyls” – sort of foreclaws, resembling those of praying mantis insects – that they carry tucked beneath their heads. Like all good crustaceans, they’re equipped with antennas, stalked eyes and bodies with three distinct sections – head, thorax and abdomen – protected by exoskeletons of hard, chitinous plates that they periodically replace through molting. They have three pairs of walking legs and four sets of abdominal appendages that are feather-like gills. They’re found in pretty much every type of habitat in tropical and subtropical waters, living in burrows in the sand or mud or in crevices and hollows in corals. Several species live at depths of 60 feet or more, others as shallow as the intertidal zones. Often, all you see of them is their faces staring up from their burrows in the bottom. Worldwide, there are approximately 400 species of mantis shrimps but apparently only a handful found in the Caribbean/Atlantic, versus hundreds in the Indo-Pacific. As usual, the more colorful species are found throughout the Indo-Pacific. “Spearers” often lurk in their burrows ready to ambush prey. With large, peanut-shaped eyes, this appears to be a species in the genus Lysioquillina. In terms of predation techniques, there are two different types of mantis shrimps, both of which deploy their dactyls (foreclaws) with incredibly rapid thrusts clocked at nearly 50 miles an hour. Spearers’ dactyls have as many as 17 needle-sharp spines with which they impale soft-bodied victims like fishes, shrimps, even squids (and unfortunate fishermen’s hands). Smashers’ dactyls have (relatively) large hammer-like heels they use to pound hard-cased animals like crabs and snails with enough force to break them up. Large ones have been known to bust through aquarium glass. It’s believed they can strike 50,000 times between molts without serious damage. It’s been known for some time that mantises strike quickly and powerfully – just not how much so. Researchers at the University of California, Berkeley had already determined that mantises powered their strikes with specialized springs in their limbs that store and release immense energy. They set out to measure that force in a study reported in the Journal of Experimental Biology in 2005. By smearing shrimp paste on sensors for mantises to pound, they found the animals not only smash with an impact force thousands of times their body weights but that each impact produces two force peaks a half-millisecond apart. While the first peak reflects the physical blow, the second is the result of cavitation – vapor bubbles formed by the exceptional speed of the strike that implode with immense force against the target’s surface. Mantis shrimps’ eyes are among their most exceptional features – a pair of compound eyes situated atop movable stalks that each contain as many as 10,000 ommatida (more-or-less, lens structures). They point in different, often over-lapping, directions with a complexity that, essentially, gives each eye binocular (or better) vision, enhancing their ability to scan their environment for threats or prey. The shapes of their eyes vary depending on the mantis’ lifestyle. Spearers tend to work by lying in wait in their burrows to ambush passing prey, often at night or in murky, low-light waters. Spearer species have evolved large, broad, peanut-shaped eyes that maximize light-gathering but don’t distinguish color. Smashers tend to live in clear shallow waters, often hunting in the open. They’ve evolved smaller, rounded eyes whose color perception is probably better than human beings. They also tend to sport more colorful bodies. In 2008, a team of researchers from the University of Queensland and the University of California, Berkeley reported in the journal Current Biology that they had found that mantises are capable of seeing a type of polarized light that no other animal is known to be able to detect. Although the capability’s purpose is unknown, it’s speculated that it may play a role in mating or perhaps in enabling enhanced contrast in turbid environments. It turns out mantis shrimps don’t only pound forcefully, they also get pounded – by other mantis shrimps. They engage in ritual fighting to settle issues like which one gets to use which burrow. Mantis-á-mantis combat involves smashing one another on their telsons, or tail-plates. It’s ritualistic because the heavily armored plates have evolved to be pounded without serious effect. Researchers at Indiana University-Purdue University and the University of California, Berkeley, wondered how the telson could take such abuse. So they tested the telsons of 17 mantis shrimp carcasses by dropping stainless steel balls on them. Analysis revealed that the plates are composed of relatively inelastic material that, like a punching bag, dissipates most of the impact energy. Mineralization patterns and other factors indicate that they’re composed of stiff and compliant regions, resembling the design of impact-resistant armor. The work was reported in the Journal of Experimental Biology in 2010. Researchers at the University of California, Riverside, used x-rays, electron microscopes and other tools to study of the composition of mantis dactyls in a study just published in Science Magazine (June, 2012). They found a series of layers – a crystallized form of hydroxypatite, a mineral found in bone; more layers of uncrystallized hydroxypatite and an inner layer of chitin interlaced with hydroxypatite. They concluded that the complex arrangements allows small cracks to form but not to spread. PRINCIPAL SOURCES: Crustacea Guide of the World, Helmut Debelius; Reef Creature Identification, Florida, Caribbean, Bahamas, Paul Humann and Ned Deloach; Journal of Experimental Biology: “Extreme impact and cavitation forces of a biological hammer: strike forces of the peacock mantis shrimp Odontodactylus scyllarus,” S. N. Patek and R. L. Caldwell, 2005; “Elastic energy storage in the mantis shrimp’s fast predatory strike,” T. I. Zack, T. Claverie and S. N. Patek, 2009; “Ritualized fighting and biological armor: the impact mechanics of the mantis shrimp’s telson, J. R. A. Taylor and S. N. Patek, 2010; Current Biology: “Circular Polarization Vision in a Stomatopod Crustacean,” Tsyr-Huei Chiou, et al, March 2008;Science Magazine: “The Stomatopod Dactyl Club: A Formidable Damage-Tolerant Biological Hammer,” James C. Weaver, et al, 2012.